Last year I made and sold many pairs of fingerless gloves at my Christmas markets but, unless you bought a pair in person, very few people saw any photos of them online other than in the background of my stall photographs! 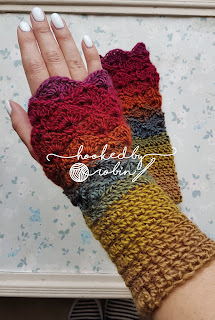 Last week, prep began again in earnest for my upcoming seasonal craft fairs and I popped a photo up on my Instagram of my gloves and my phone lit up like a Christmas tree with people excited about the pattern! So, as promised, here it is! 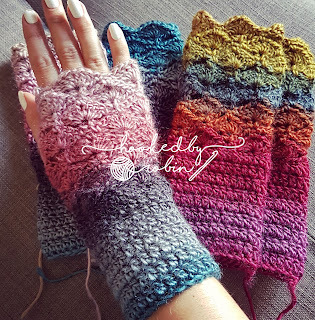 I am aware many people struggle with written patterns so I will also be making a YouTube tutorial for these gloves very soon - just awaiting a little arm thingy to arrive through the post that can hold my phone whilst I crochet so I can do a little crochet along with you all! You will only need one ball of yarn for these gloves. I personally buy 2 balls so I can line up the colours so each glove matches its partner. Nothing makes my ocd eye twitch more than mismatched gloves! Although saying that, sometimes you will get lucky. 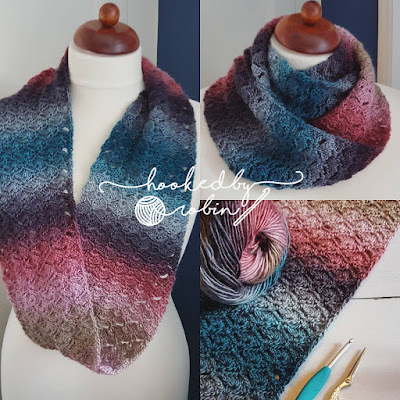 I had 2 balls of Moonbeam on my shelf so grabbed those for this pattern. They were almost perfectly matched from the outset. Heaven! I only had to cut off this tiny amount from one ball before winding. The yarn gods were being kind to me today. 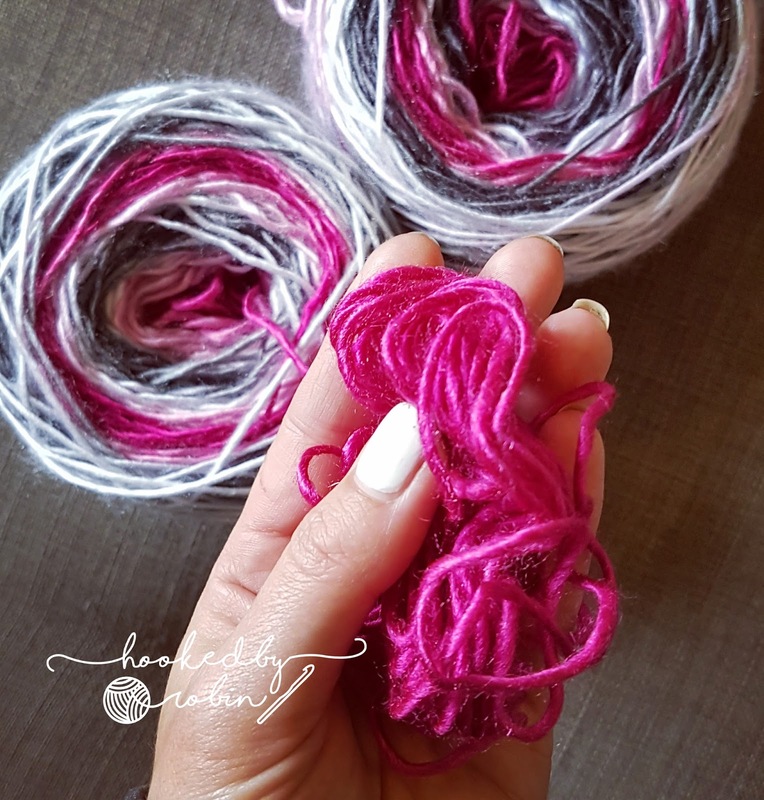 · Red Heart Unforgettable – you may find you need to up your hook to a 4.5mm or even a 5mm on the shell rows as this yarn doesn’t seem to have much “give” to it. Try your gloves on periodically if using this yarn to make sure it still fits your hand nicely. Adjust your hook size accordingly. · King Cole Riot – not as soft as Boho Spirit and a little finer – should still work ok with a 4mm hook but it’s been a while since I’ve used it so I’d give the same advice for this yarn as I have for the Red Heart. I have freakishly small hands (as I referred to in my last gloves pattern LOL) but have tried to make these crochet fingerless mitts a universal size to fit everyone. I recommend you complete the first couple of rows and try it on to double check the fit – too baggy? Try dropping a hook size (I often use a 3.5mm instead of a 4mm for my own personal gloves) Too small? Try upping the hook size. If you spot any errors or typos in this pattern PLEASE shout – I have gone a little pattern blind so you are all my pattern testers LOL ! This is a simple pattern that is easily adjusted – rounds of dc for the wrists then fantail shell stitch pattern for the hands. OK so lets begin! Working in joined rounds to start. Ch2 (does not count as a stitch) dc in same stitch as ch2. Dc in next stitch. I have added a chart for fantail stitch to help you visualise the rows - ignore the end and start on this chart, just look at the middle sectioning - it is the closest I could find to help! Ch1 (does not count as a stitch) sc into the same stitch. Ch1, skip 1 stitch, sc into the next. Skip 3 stitches, shell (3dc, ch1, 3dc) into next. *skip 3, 1sc, ch1, skip 1, 1sc, skip 3, shell* repeat 2 more times. Ss into 1st sc of the round, then ss into ch1 space. Ch3 (counts as hdc, ch1) hdc into same space. *ch3, sc into the ch1 sp of shell, ch3, hdc v-stitch (hdc, ch1, hdc) into next ch sp. * repeat 3 more times. Ch3, sc into the ch1 sp of shell, ch3, ss into 2nd ch of intital ch3 of the round. Ss into the ch sp. Ch4 (counts as 1dc, ch1) 3dc into space. Sc in ch3 sp, ch1, sc into next ch3 sp. *shell into ch sp of hdc v-stitch from row below, sc in ch3 sp, ch1, sc in next ch3 sp* repeat 2 more times. 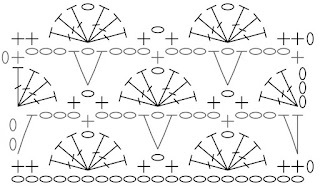 2dc into same space as initial ch4, ss to 3rd ch of initial ch4 and then ss into ch sp. Ch1 (does not count as a stitch) sc in same stitch. *ch3, hdc v-stitch in ch1 sp from row below, ch3, sc in ch1 sp of shell* repeat 2 more times. Ch3, hdc v-stitch in ch1 sp, ch3, ss to 1st sc. Ch1 (does not count as a stitch) sc in next ch3 sp. *shell into ch1 sp of hdc v-stitch from row below, sc in ch3 sp, ch1, sc in next ch3 sp* repeat 2 more times. Shell in ch1 sp, sc in ch3 sp, ch1, ss to 1st sc. *ch3, sc in ch1 sp of shell, ch3, hdc v-stitch in ch1 sp* repeat 2 more times. Ch3, sc in ch1 sp of shell, ch3, ending with hdc v-stitch into the SAME ch1 space from Row 13 as you put your initial ch3 & hdc from the beginning of the round. (you will have ch3, hdc AND a hdc v-stitch all in the same place) TURN. Ch3 (counts as dc) 2dc in the same space. *sc in ch3 sp, ch1, sc in ch3 sp, shell in ch1 sp of hdc v-stitch from row below* repeat 2 more times. Sc in ch3 sp, ch1, sc in ch3 sp, ending with 3dc into the sp of hdc v-stitch from row below. TURN. *ch3, hdc v-stitch in ch1 sp, ch3, sc in ch1 sp of shell* repeat 3 more times ending with your last sc being placed into the top of your ch3 from the row below. TURN. Ch1 (does not count as a stitch) sc in top of sc from row below. *shell in ch1 sp, sc in ch3 sp, ch1, sc in next ch3 sp* repeat 2 more times. Shell in ch1 sp ending the row with a sc into the top of the sc from the row below. TURN. BACK TO WORKING IN JOINED ROUNDS. Do not turn your work. Repeat Row 16 BUT DO NOT TURN YOUR WORK. Instead, end this row with a slip stitch to the 1st sc you made in this row. Ch3, sc in ch1 sp of shell, ch3, ss to 2nd ch of initial ch3 then ss into ch sp. Ch3 (counts as 1dc) 2dc, ch1, 3dc into space. Sc in ch3 sp, sc into next ch3 sp. *shell into ch sp of hdc v-stitch from row below, sc in ch3 sp, sc in next ch3 sp* repeat 2 more times. Ss to 3rd chain of initial ch3. 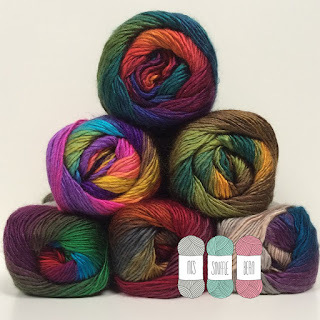 How would you like a sneaky little exclusive yarn discount code? Mrs Snufflebean Yarn has very kindly given us 10% off all Boho Spirit yarn – this coupon is only valid until the end of November 2017 so be quick if you want to take advantage of it! 10% Coupon has now expired She offers free postage on orders over £25 so what are you waiting for? 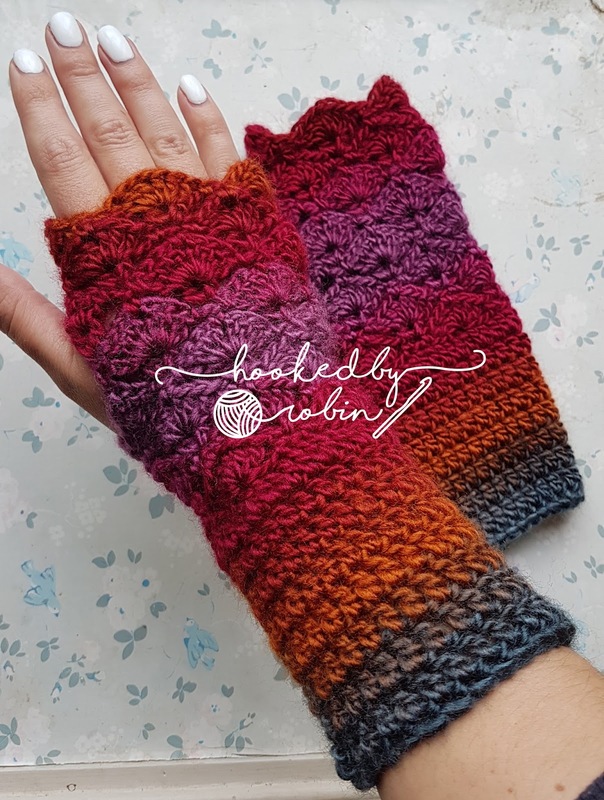 You can make a pair of gloves in EVERY COLOURWAY! 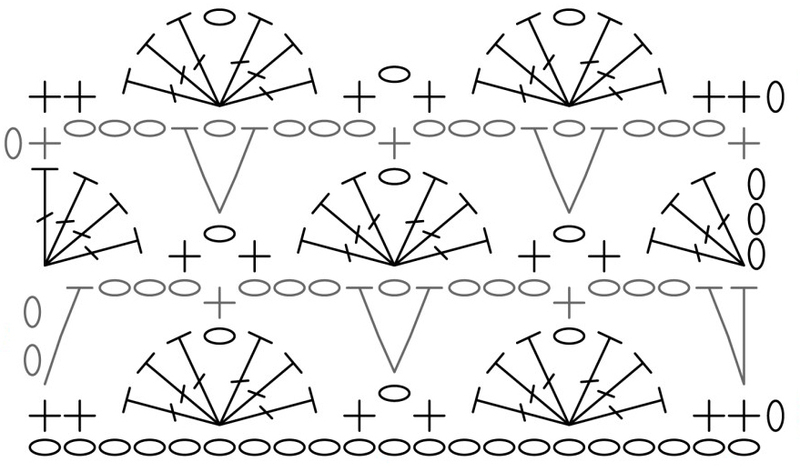 If you have any questions about this pattern / spot any errors / notice any typos just holler!